Precision-machined stainless steel piston and cylinder using predetermined weights applied on the upper end of the piston rod. 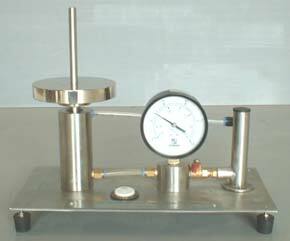 Assembly gauge connected to the cylinder, subject to known pressures, comparison with the Bourdon gauge reading can be made. Test weights.